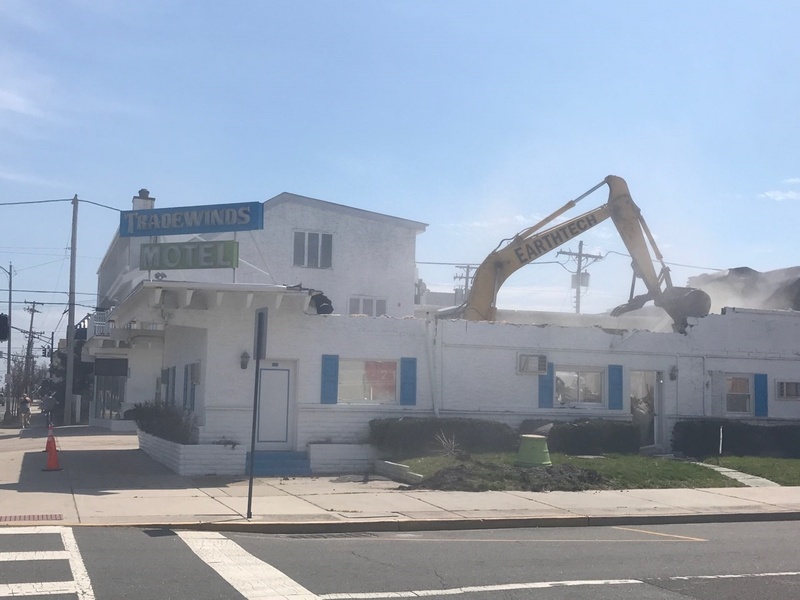 Demolition crews began work to demolish the Tradewinds Motel at 600 E. Ninth Street in Ocean City Monday. 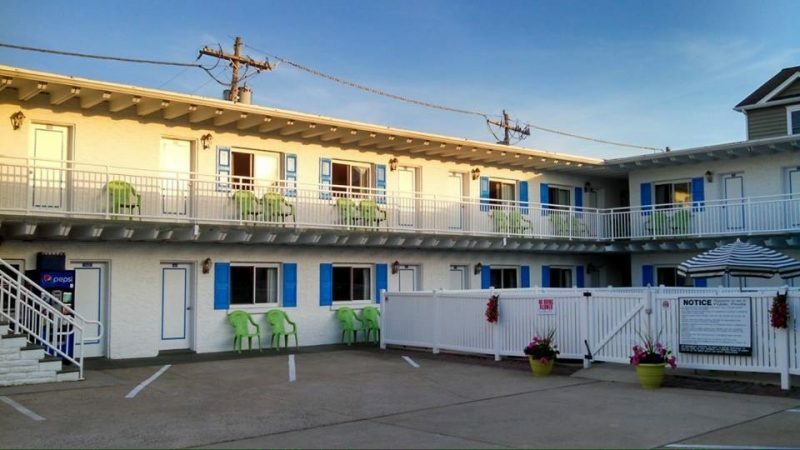 The Tradewinds Motel boasted that its convenient location, just a five minute jaunt to the Ocean City Boardwalk, casual rooms and inviting pool were some of the reasons guests should explore this laid back alternative to pricier accommodations. On Monday, the thought of staying at the 1950s-looking era motel at 600 E. Ninth Street, were just a memory, as demolition was underway to turn the building that was pet friendly and touted its mini fridges and free Wi-Fi, into rubble. 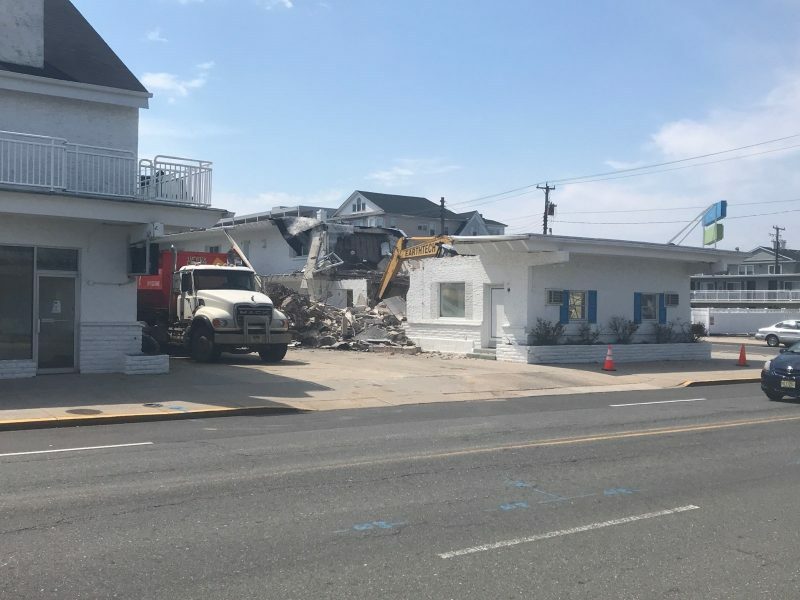 “A demo permit was issued today, and they are working on it,” confirmed Ocean City Construction Officer Neil Byrne Monday. The Tradewinds Motel was one of just a few left like it in Ocean City. The Forum, at 800 Atlantic Avenue, evokes similar nostalgia of the old style motels but unlike the Tradewinds, it will remain standing, at least for the near future. The Forum was purchased on March 1 by brothers Raj Khatiwala and Yogi Khatiwala. 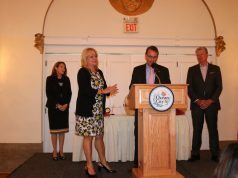 In an interview with OCNJDaily.com they said they will continue to operate the 1950s-era business as a motel. The Khatiwala brothers said they plan to enhance the property by making some improvements inside and out. They also said they will keep the same staff. 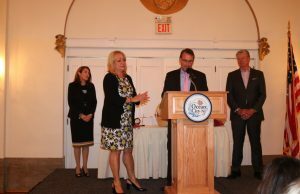 The Impala, another motel in town, was purchased by developers Chris Glancey and Bob Morris last year. 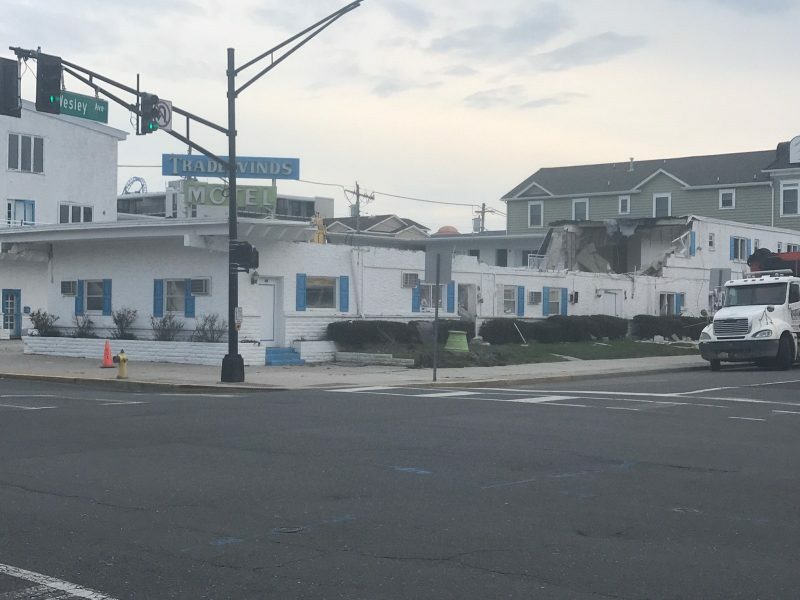 Glancey and Morris are planning to build a new boutique-hotel across the street from The Impala, which is at the corner of Ocean Avenue and 10th Street. 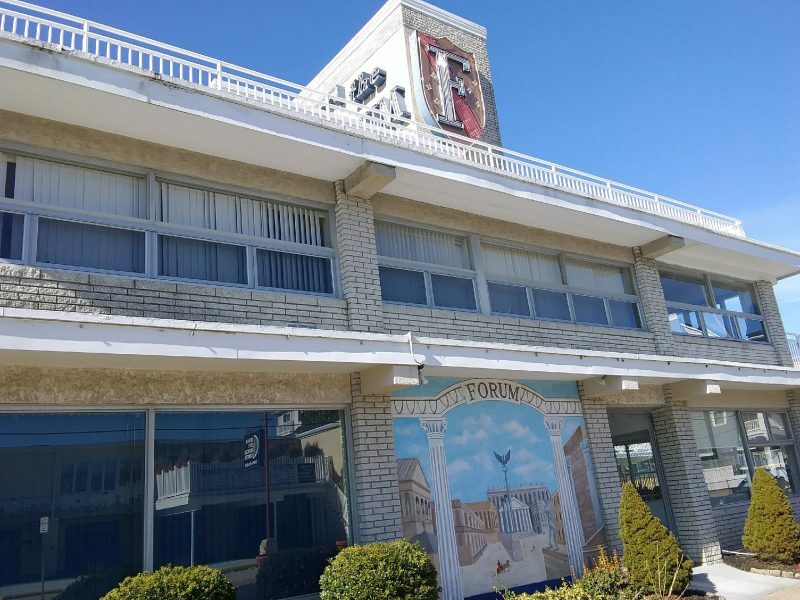 The Forum Inn, located at 800 Atlantic Ave. in Ocean City, is a similar style property to the Tradewinds Motel. Other similar properties are being converted into multi-unit housing, according to realtors. 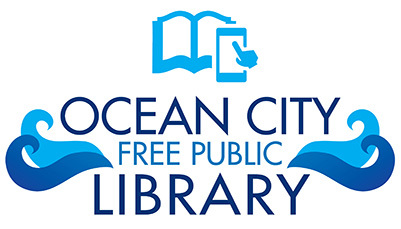 According to the Ocean City Vistor’s Guide 2019, there are 28 hotel and motel accommodations in the resort. That does not include B&Bs. 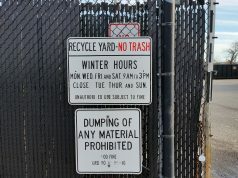 It is unclear what is planned for the lot where the Tradewinds once stood. Dan Young, attorney for the owners, could not be reached for comment about potential plans for redevelopment on the site. Tradewinds Motel demolition continues through the day. Crews take down the Tradewinds Motel.